A 2010 Transport Canada report that revealed that school buses “failed” safety tests and did not do enough to prevent “serious injuries” was kept hidden from the public,The Fifth Estate has learned. A 2010 Transport Canada report that revealed that school buses "failed" safety tests and did not do enough to prevent "serious injuries" was kept hidden from the public, The Fifth Estate has learned. The study, which showed that high-backed, padded seats on school buses did nothing to help children in side-impact and rollover crashes, was marked "Internal Research Report" and was not posted on Transport Canada's website or otherwise made available to the public until The Fifth Estate asked for it last month. 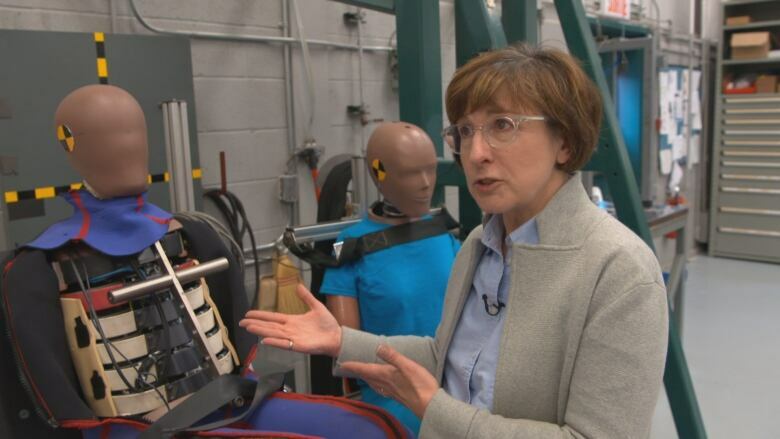 Suzanne Tylko, chief of Transport Canada's testing facilities in Blainville, Que., said she did not know why her report was not released publicly and that it was not her decision to make. "I couldn't tell you why," she said. Transport Canada's media relations office released that study, and others, to The Fifth Estate after it requested all studies the department might have conducted on school bus safety. That process took several days after Transport Canada initiated an approval process to release them. In a later email, the department said the research report was initially "intended" as an internal document and was later discussed with "various stakeholders" but did not say who those people were. The department has yet to release the document publicly or make it available on its website. 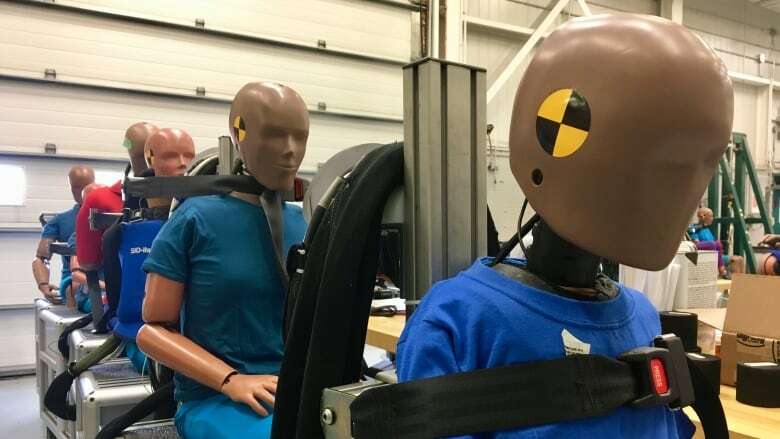 The internal report reveals that the department carried out a side-impact test and showed that a system called "compartmentalization" was not effective and "failed to contain" the dummies in their seats. The test results also differed greatly from the position Transport Canada has held publicly since 1984 regarding seatbelts on school buses — that they could do more harm than good. "The conclusion [of the 2010 report] was… that the seatbelts do prevent ejection," Tylko told The Fifth Estate. Tylko wrote that she observed during the test that one unbelted passenger "crossed the aisle and exited through the window." In another instance, she found a "severe" impact when the head of a dummy struck a window frame of the bus. After her observations, she wrote that existing safety measures in school buses are "inadequate." Tylko's 50-page internal report contains photos, graphs and other crash data and comes to conclusions that differ greatfy from a 1984 Transport Canada study that said belts could be harmful to students. Yet to this day, Transport Canada continues to insist on its website that there is "no evidence" that seatbelts would prevent injuries. For years, the Canada Safety Council, a non-profit safety watchdog, echoed that same message. In an interview with The Fifth Estate, Lewis Smith, the council's manager of national projects, said that seatbelts could harm children on school buses. "The shock-absorbent material absorbs most of the blow and the injuries are kept to a minimum," he said. "The design of school buses makes them exactly in that sphere where seatbelts are not helpful and in some cases can actively be harmful." Smith said that his belief was based on Transport Canada's previous test crash research. He said he had no idea the department conducted another test crash in 2010. "As a safety advocate, I firmly believe that anything that advances the cause of safety should be made public, and the fact that this hasn't crossed our radar at all ... is certainly very troubling." Smith said this new information could reverse the organization's longstanding assertion that seatbelts on school buses are dangerous. "It's very concerning, " he said. "I'd absolutely like to see the evidence behind it and that could very well change our position." Transport Canada's 1984 study has been cited by numerous organizations as a reason not to install seatbelts, including school boards and provincial transport ministries. In 2000, the department held a series of stakeholder meetings on the topic of seatbelts in school buses after acknowledging the general public was demanding answers. In a report titled "Bus Safety Consultations" that summarized those meetings, Transport Canada wrote "there is a perception by the public (mostly parents) that seatbelts should be installed on school buses." The report then stated that the public was "not properly informed" and that those U.S. states that mandated seatbelt use were doing so for "political" and not safety reasons. The Transport Canada report stated some stakeholders felt that the department should conduct an education campaign around school buses, including bedtime stories and colouring books for children. Transport Minister Marc Garneau declined repeated requests for an interview with The Fifth Estate.